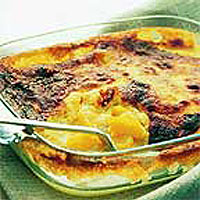 This is one of those scrumptious dessert mixtures that separates during cooking to form a golden spongy crust on top with a smooth, fruity custard underneath. Serve with lemon sorbet. Preheat the oven to 180°C, gas mark 4. Using an electric whisk, beat together the butter and sugar until light and fluffy. Whisk in the lemon zest and juice, and 3 of the egg yolks. Sift the flour over the mixture, then add the mango pieces and milk, stirring gently. In a separate bowl, whisk the 4 egg whites until they form soft peaks, then gently fold into the mango mixture. Pour into a 2-litre baking dish and cook for 45 minutes until golden and set. Serve with scoops of lemon sorbet.